Based on an instinctively familiar form, Patterns elevates a simple folded plane to sophisticated design. With its broad material options and an anodized aluminum inlay, Patterns injects a level of refinement. 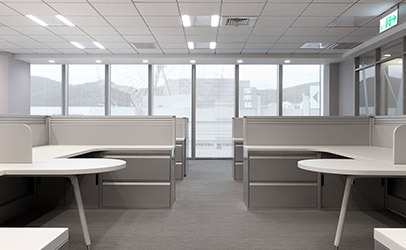 From sleek, low benches and clean studio desking to architecturally intriguing workwalls and portals, Patterns offers a new dimension to the floorplate. Use Patterns to create unique interiors and eliminate the sea of sameness. VAST fosters a more naturally human experience of work by enabling people to feel comfortable, valued, and connected in their workspaces.it transforms workplaces into strategic tools for attracting and retaining employees, and for communicating an organization’s brand. The system’s unique aesthetic is a compelling addition to diverse office landscapes where people have a choice of supportive furnishings. Customizable screens and a thoughtfully curated palette of colors, materials, and finishes offers opportunities for expressing an organization’s identity. The open angle at the core of VAST’s design creates an inviting work area, encourages interaction with colleagues, and gives even small spaces a spacious feel. Without the restriction of panels or walls, air and light can pass through the space, and people can see in and out. Screens and canopies balance this openness by providing enclosure and offering privacy. VAST helps organizations address economic concerns while attending to the needs of people—a critical balance that delivers greater performance and value to everyone. The system is quick to install and reconfigure, and easy and inexpensive to refresh. Its compact footprint occupies less space in the landscape than traditional solutions, but provides more opportunities for individuals to achieve a comfortable balance between focused work and interaction with others. VAST transforms workplaces into strategic tools for attracting and retaining employees, and for communicating an organization’s brand. The system’s unique aesthetic is a compelling addition to diverse office landscapes where people have a choice of supportive furnishings. Customizable screens and a thoughtfully curated palette of colors, materials, and finishes offers opportunities for expressing an organization’s identity. VAST offers a diverse palette of colors and materials that can be used to enhance the activities of people within the workspace. .